HomeWhat are Leo Metal Horse personality traits? 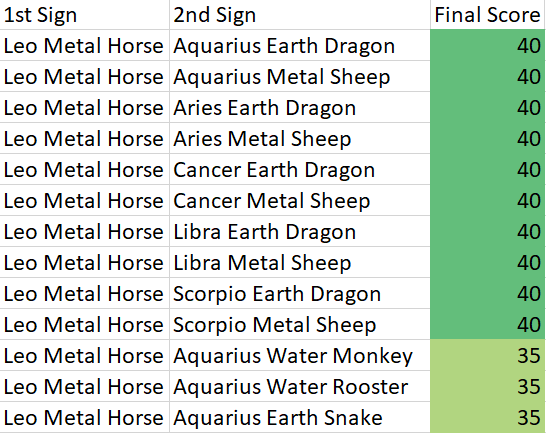 What are Leo Metal Horse personality traits? Leo Metal Horse signs are generous. They are not hesitant to give more than other people. They have a strong sense of loyalty so don’t worry about them stabbing you in the back, in fact, they will probably save you from one. The LMH sign is a determined character and will be able to see straight to their goal. They are also self-reliant and will be fine by themselves. When they come into trouble, they are able to find their way out. The Leo Metal Horse is a cheerful animal and will make the atmosphere positive when they are present. They are also very popular so social skills are one of their strong points. On the other hand, when Leo Metal Horses are brought up in a reputable background, they can be pretentious. The king of the jungle will demand things that they feel they are entitled to. Their arrogance will make them think highly of themselves which can sometimes hurt others around them. LMH can be forceful in terms of doing things their way and sometimes, you will have to compromise. They are impulsive and will do and act on their feelings more than using logical thinking. The Leo Metal Horse can be stubborn and will not yield to anyone’s opinion sometimes. They can also become very talkative to the point where it can be annoying to listen to. ← What are Aries Wood Dog personality traits?